The Democrats have decided that agendas are overrated. Back in May, the party unveiled its "Better Deal" program, calling for expanded broadband access, an increase in the minimum wage, and paid family and sick leave. Voters didn't bite. So last month the Democrats came up with "For the People," which simplifies the platform to infrastructure spending, lowering health care costs, and draining the swamp. Again, crickets. What to do? Party leadership has declared that it's every cis-het man for himself. "We trust our candidates to know their districts and the challenges facing their communities better than anyone," House campaign chair Ben Ray Luján tells the New York Times. Translation: If you are Conor Lamb, run as a gun-friendly champion of the working class. If you are Rashida Tlaib, feel free to announce that you would vote against aid for Israel and to call for bi-nationalism that would end the Jewish State. Texas Democrat Colin Allred, following Hillary Clinton, says everyone should be able to buy into Medicare. Maine Democrat Jared Golden, following Bernie Sanders, says, "We need to move towards a universal health care system, like Medicare-for-all." Such diversity of approach troubles the philosopher kings of Forty-First Street. Discarding a "Washington platform," write Sheryl Stolberg and Nicholas Fandos, is "a risky strategy." It leaves unanswered the question of what the Democratic Party stands for. It "could raise questions among voters about how Democrats would govern." Questions to which there are few substantive answers. The truth, though, is that the Democrats do have an agenda. They just can't say it aloud. The reason Democrats seek power in 2018 is to obstruct President Trump wholly and without exception, to tie down his administration using the subpoena powers of a dozen committees, and ultimately to lay the groundwork for his impeachment. The Democratic grassroots expects nothing less. But the Democratic leadership understands that this unspoken agenda is unpalatable to the rest of the country. Swing voters may long for institutional checks against Trump, but they are leery of impeachment. Suburbanites may be annoyed by the president's tweets, but they still believe that both sides should "put aside their differences" and "get something done." The Times notices that many of the Democrats running in Republican-held districts "rarely mention the president by name." What these candidates understand is that explicitly making the 2018 election about Trump—which it certainly is—risks motivating Trump supporters to rally to his defense. Better to keep quiet, have Trump loom in the background, and adapt to local circumstances as much as possible. Or as Nancy Pelosi put it recently, "Do whatever you have to do, just win." Now, concealing the agenda of obstruction, investigation, and impeachment is one way to address the problem of an anxious middle. But it also creates another problem: Without cohesion, discipline, and guidance from above, the loudest and most extreme figures and ideas are free to capture the public's attention. 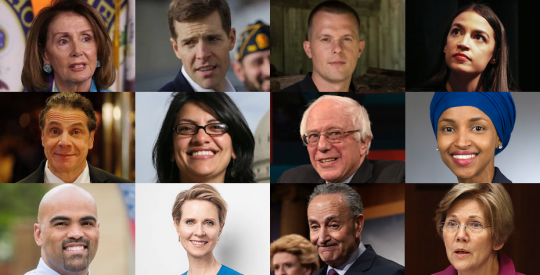 Nancy Pelosi and Chuck Schumer can talk about insurance premiums until they are blue in the face, but the headlines and cable channels will be filled instead with mentions of Alexandria Ocasio-Cortez, Bernie Sanders, Keith Ellison, Ilhan Omar, Andrew "Never That Great" Cuomo, Elizabeth "Racist From Front to Back" Warren, Cynthia "Let's Just Be Socialists" Nixon, and campaigns to abolish ICE, line items of $32.6 trillion for single-payer health care, and other vagaries of democratic socialism. Generic candidates may win either the House or both the House and Senate for the Democrats. In so doing, however, they would bring into office radicals empowered by the election returns and unaccountable to party authority. And so a Democratic victory soon would be followed by Democratic infighting. There would be a battle over the future of Pelosi, a squabble over committee assignments, a clash over which single-payer health bill is brought to the floor. All of these struggles would distract from and potentially inhibit the larger campaign against Trump. We've been here before. Republicans sought to harness the energy of the Tea Party in the 2010 election, only to miss several opportunities for Senate pickups because of unelectable candidates produced by ideological zeal. The desire on the part of Republicans to confront the president they despised led them to misunderstand the separation of powers and overreach in both the debt-ceiling fight of 2011 and the government shutdown of 2013. Lacking a coherent agenda beyond opposition to President Obama, the Republican House became his chief foil. Frustrated by impotence amid rising expectations, the Republican base became increasingly discontented and open to alternatives from outside the political establishment. Sublimating their real agenda while avoiding intra-party debates may be enough for the Democrats to win in 2018. But that victory, should it happen, has a price. The bill comes due in 2020. This entry was posted in Columns and tagged 2018 Election, 2020 Election, Democrats. Bookmark the permalink.